This thing that we get to do called Photography is so much more than taking pretty pictures. It is being invited into peoples lives. Celebrating life and milestones. Capturing this moment in time for them and generations after them to look at reminisce. When I sit down to think about this, it really is such an honor. it brings such an excitement and joy that I just cannot explain. Bond & Kristina are one of these couples. 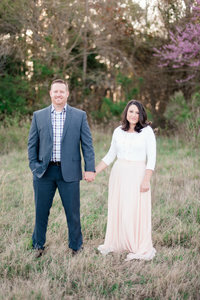 We literally just met them during their engagement session… And yet they were so genuine and down to earth that we just loved every minute with them. They have been together for over 10 years!!! That is almost as long as Luke & I have been married! Dating since High School, they have always been smitten over one another. What an awesome way to start a marriage with so much history and memories together! These two plan to marry next year at The Botanical Gardens. Such a beautiful venue to have a wedding! Thank-you Bond & Kristina for such a fun afternoon. It was so much fun getting to know you both and exploring your neighborhood! We are truly looking forward to next June! Enjoy some of our favorites from your awesome session!! And I am warning you… There is LOTS of BLING! Look at this Lovely Bouquet of flowers!! That is all credit to the Beasley kids right there! Love how they are always thinking of creative ways to capture the ring! And Kristina’s ring is absolutely GORGEOUS! Bond you did… You did real good! Bond’s mom and future M-in-L of Kristina. Thank-You!! We had such a fun time with them!